A gallery of photographs capturing some of the activities of the Lawrence County Historical Society -- and a bit our past. From gold mining and ranching to logging and railroading, Lawrence County has something for everyone -- including the rich history of old Deadwood. These photos cover the years 2008 to 2014. If you're looking for a more recent gallery, go to LCHS 2013-14 Gallery or LCHS 2015-16 Gallery. All LCHS photo galleries are linked with Historical Marker, the official site of the Lawrence County (SD) Historical Society. You can click on any image to see a larger version. Questions or comments? Send us an E-MAIL. THE FLOOD OF 1972 NEAR NEMO ROAD There has been considerable coverage about the devastation that hit the immediate Rapid City, South Dakota, area in the massive flood of 1972. As you might expect, there were other areas in the Black Hills region that were affected by the flood. The following flood photos were taken the day after the flood by Vern Kraemer on June 10, 1972 and provided to us by his wife, Norma. 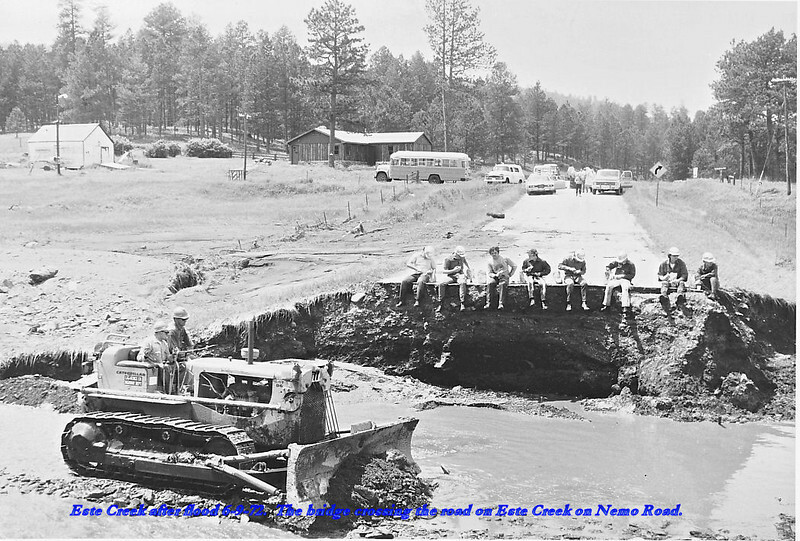 Este Creek after the flood of 6/9/72. The bridge crossing the road on Estes Creek on Nemo Road.